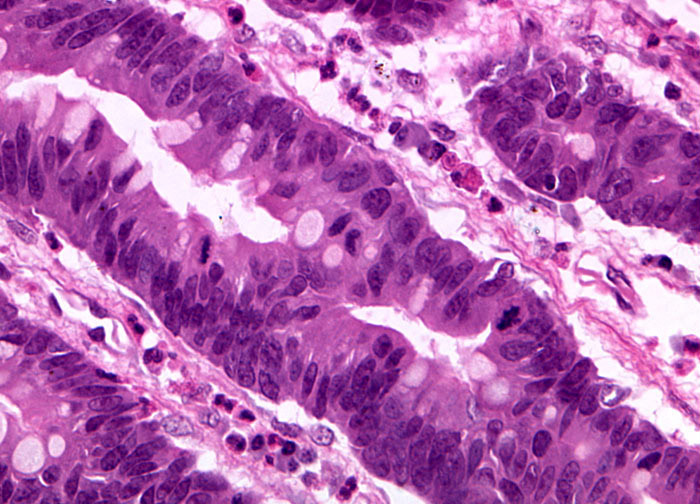 The vast majority of stomach cancers are classified as adenocarcinomas, tumors that originate in epithelial cells and exhibit gland-like properties. Only about five percent of all cases of the disease are lymphomas, carcinoids, squamous cell carcinomas, leiomyosarcomas, or other types of cancer. Stomach cancer is not one of the top causes of cancer-related death in the United States, but is still of significant concern. Each year about 24,000 Americans are diagnosed with stomach cancer. Individuals afflicted with late stages of the disease have a very poor prognosis with an average survival time of less than a year. When the disease is caught early, nearly 70 percent of patients survive for more than five years, but many of these individuals experience long-term effects from their treatment.